Our region’s 10 largest funders contributed more than half of all grant dollars to our region. 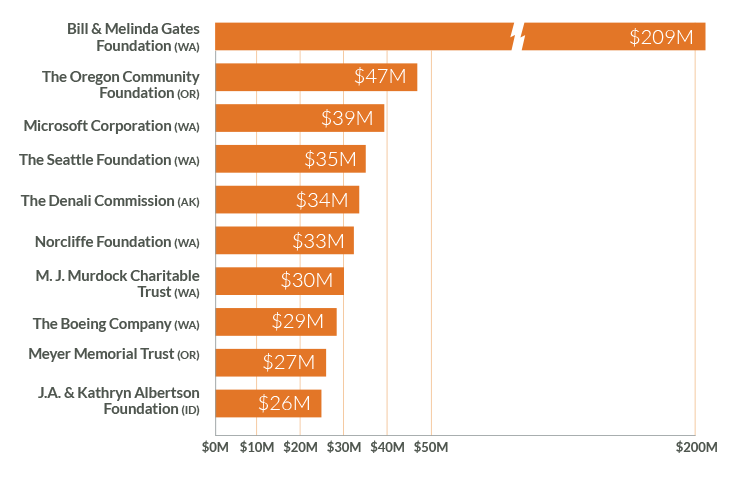 Grants made by the top 10 funders accounted for 52% of total giving to the northwest in 2012. Contributions from the Bill & Melinda Gates Foundation comprised 21% of total regional giving, up from 18% in 2010. The top 10 funders gave 61% of all health dollars ($61 million), 50% of all arts funding ($33 million) and 48% of all education funding ($115 million). the same funders contributed 82% ($154 million) of all dollars allocated to research, 54% of all capital support ($56 million) and 48% of general operating support ($78 million).